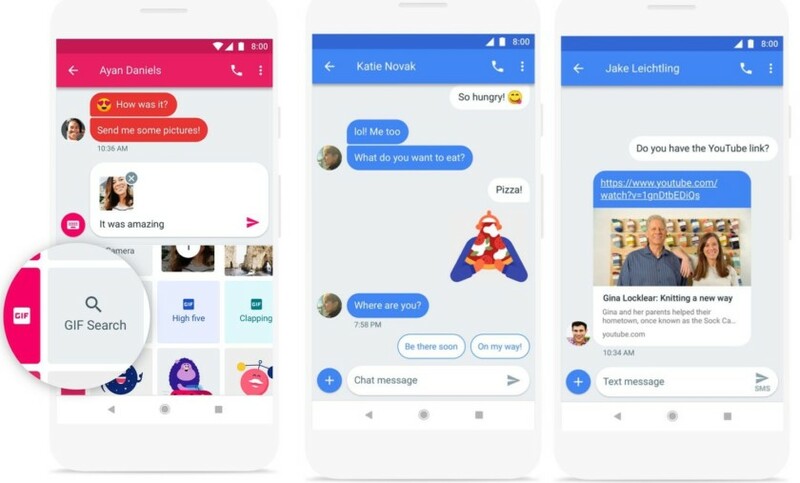 Update: Google has now released an official blog post on not just the new support for web-based texts on Android Messages, but several other new features that will be rolled out over the next week. As we previously reported, once the Android Messages app update goes live, just go to the settings menu, click “Messages for web,” then scan the QR code on the Messages web client so you can send and receive texts on your desktop or laptop. Another new feature for Messages this week will let you search and find a great GIF image to send to friends by tapping on the “+” button on the left hand side of the compose bar. Another feature is Smart Reply, which will offer suggestions for pre-generated responses to texts. Also, if a text includes a URL website link, you will see a preview of that link in the app. Finally, Android Messages will let you save a password directly inside a text message with a tap. Original story: In April, it was discovered that Google was preparing to launch a way to use Android Messages on your computer, via a web client. Now the first half of that service has gone live with the launch of the Android Messages web page. Unfortunately, the second half of this service has yet to go live. Once Google issues an update, you’ll be able to go to the settings menu in Android Messages on your phone, click “Messages for web”, and scan the QR code to connect to your computer. This Android Messages web client is similar to the Google Allo web version that was released back in August. Google has yet to officially announce this service, so we’ll be sure to update this post as we learn more.